After nearly a year of legal wrangling, research, political organizing, and consensus building at City Hall the San Francisco Labor Council helped pass a landmark piece of legislation to stop unscrupulous contractors from exploiting workers when they garnish City contracts. Led by Robert Morales of the Teamsters District Council 7, which represents truck drivers and haulers; Olga Miranda and Asha Safai of SEIU’s Local 87 Janitors; Mark Gleason of IBT 665, which represents parking attendants; and with the support of F.X. Crowley of the Stagehands Local 16 and Ramon Hernandez of Laborers Local 261, the Labor Council saw a landmark Prevailing Wage Ordinance pass the Board of Supervisors 10-1 and signed by Mayor Ed Lee. 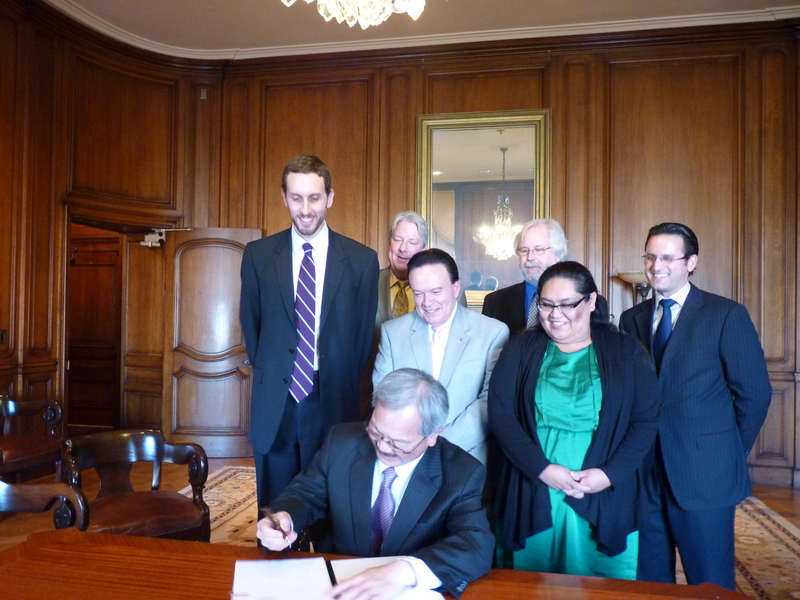 Many thanks to Supervisor Scott Wiener, who authored the legislation and helped us negotiate all the legal, political and community issues to achieve these worker protections. Extra kudos to Gillian Gillett, Supervisor Wiener’s legislative aid, for her diligent work helping us craft the language of this historic agreement. The Building Trades unions, of course, through Davis-Bacon and state standards, set the path to fair wages in the public sector. 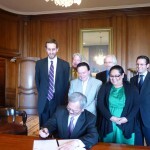 Now we have other protections in San Francisco for other workers. The Labor Council team was treated to a visit in the office by Amber Baur, our Political Director, who is on maternity leave. Amber brought the newest part of our family to the office last week. Arlo Jude Baur is the coolest kid I’ve seen in, well… maybe ever. Amber ,we miss you but enjoy all your time off with Roem and Arlo. There will be plenty of work which will need your talents and expertise to fight for workers’ rights in 2012 when you get back. This entry was posted on Wednesday, February 22nd, 2012 at 12:10 am	and is filed under Blog. You can follow any responses to this entry through the RSS 2.0 feed. Both comments and pings are currently closed.